The space shuttle Discovery is shown inside its Orbital Processing Facility, a maintenance hangar used to service the spacecraft in between spacefligths, in this 2005 photo. An investigation into a small amount of cocaine found in a spaceshuttle hangar at NASA's Kennedy Space Center (KSC) in Florida has endedwithout disciplinary action. NASA's Office of Inspector General has concluded its investigation and would notcomment on the matter. KSC officials confirmed that none of roughly 200 peoplescreened for drug use after the Januaryincident tested positive, and no employees were disciplined. A space center employee notified security Jan. 12 afterfinding a small plastic bag outside a bathroom in the hangar where Discoveryis processed for flight, known as Orbiter Processing Facility No. 3. Tests confirmed trace amounts of cocaine in the bag. NASA and lead shuttle contractor United Space Allianceidentified about 200 people who had access to the restricted area around thetime the bag was found and required them to take drug tests. Managers found no shuttlework done improperly nor anything else out of the ordinary. The investigation apparently did not determine how theillegal drugs ended up in the hangar. 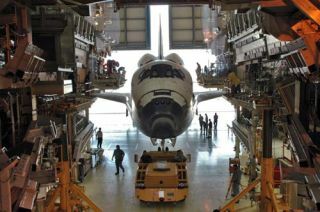 Discovery flew a successful mission in April and is slated tofly once more before the shuttleprogram is retired. Published under license from FLORIDA TODAY. Copyright ?2010 FLORIDA TODAY. No portion of this material may be reproduced in any waywithout the written consent of FLORIDATODAY.